We both thought of ourselves as full-service, one-stop film critics. We didn't see why the other one was quite necessary. We had been linked in a Faustian television format that brought us success at the price of autonomy. 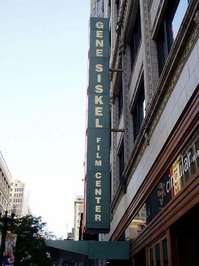 No sooner had I expressed a verdict on a movie, my verdict, than here came Siskel with the arrogance to say I was wrong, or, for that matter, the condescension to agree with me. It really felt like that. It was not an act. When we disagreed, there was incredulity; when we agreed, there was a kind of relief. In the television biz, they talk about "chemistry." Not a thought was given to our chemistry. 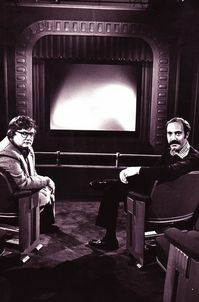 We just had it, because from the day the Chicago Tribune made Gene its film critic, we were professional enemies. We never had a single meaningful conversation before we started to work on our TV program. Alone together in an elevator, we would study the numbers changing above the door. Making this rivalry even worse was the tension of our early tapings. It would take eight hours to get one show in the can, with breaks for lunch, dinner and fights. I would break down, or he would break down, or one of us would do something different and throw the other off, or the accumulating angst would make our exchanges seem simply bizarre. There are many witnesses to the terror of those days. Only when we threw away our clipboards and 3x5 cards did we get anything done; we finally started ad-libbing and the show begin to work. We found we could tape a show in under an hour. People started recognizing us when we went out of town. "Life is going to change," Gene said. Joe Antelo, the producer who brought us into syndication, took us to NATPE, the convention of syndicated TV shows, and forbade us to walk around the floor unless we were together. "Together, you're an advertisement," he explained. "Apart, you're tourists." People would ask, "Aren't you those two guys?" 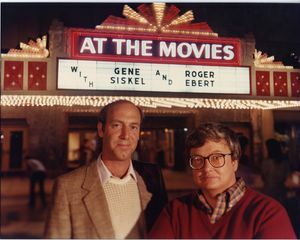 Once when we were on an elevator, some ladies started whispering to each other and when we got off, Gene looked back and said, "We're those two guys." Both of us were obsessed with our newspaper jobs. That was our identity. TV was part-time. We were competitive, but not equally competitive. Gene was the most competitive man I have ever met. Everything was an opportunity. At PBS, the camera crew played with one of those toy gambling games where you threw little metal pigs on the floor and bet on how many of them landed on their feet. Something like that. I never understood it. They gambled for nickel stakes. One day Gene said, "Let's make it more interesting," and suggested raising the stakes to a quarter. Then he started to win. There was no way he was cheating. Gene had taken the pigs home with him and mastered the game. Another time on an airline flight, we were sitting next to each other playing gin rummy, and for once I succeeded in making the right play and Gene threw his cards down on his tray table so hard they flew all over the aisle. We never played gin again. Gene had only scorn for games of chance. We went to Vegas a lot and I never saw him play a single one. He would gamble in only two ways: Poker and horse racing, where it didn't have to be blind luck. He said he was a net winner. I found that unlikely. His horse-betting buddy was Johnny Morris, the Chicago Bears star who worked with him at Channel 2. Morris was also said to be a gifted bettor. I was told by a third party that they were both, in truth, successful. I reported this to Gene and asked him what his rules were. "Roger," he said, "there is only one rule: Never play a hunch." In Vegas, I played the $5 poker tables but Gene was over in the more talented section of the room. At his bachelor party, he swept the tables with his winnings. At my bachelor party, he was a big loser. I asked him what went wrong. "What went wrong," he said, "is that your friends don't know how to play poker. A good player can never win against someone who makes a bet just for fun." He had season tickets for the Bulls going back to the 1970s, and told me they were a "good young team." When Michael Jordan joined the team in 1984, Gene began to follow Jordan and the Bulls with a passionate intensity. He and Marlene even bought front row tickets--not cheap, but more important to Gene than a car. He was a fan, but not a mindless fan. He became a student of the game. He looked in basketball for the kinds of "tells" a poker player looks for. He said Jordan was better at reading another player's tells than anybody else in the game. He asked the coach, Phil Jackson, "Why does Dennis Rodman almost always miss the first free throw?" Jackson said, "Why do you think?" Gene said, "For some reason, he thinks he has to." "He didn't tell me what he thought," Gene said. "A good coach would never do that." Gene was formidably well-informed. It was a sort of armor. He made it his business. He knew the best restaurants, but that was child's play. He knew fine art and antiques. He knew things like the best tuna-salad sandwich in Los Angeles (the Apple Pan) or the best Italian beef sandwich in Chicago (Mr. Beef). We agreed that Father & Son made the best thin-crust pizza in Chicago. We agreed that deep-pan "Chicago style" pizza wasn't worth the time of day. Gene knew the safest family cars, and those were the only ones he drove. He knew the best school for his children. I never thought of buying a place to live without asking his advice. When Chaz and I were looking at a house, we asked him to check it out. He walked through the house briefly and said, too quickly I thought, "Don't buy it." We asked why not. "I don't like the skylight," he said. What's wrong with it? "From their windows," he said, "your neighbors can see you walking to the bathroom." He was a bachelor when I first met him, living in an apartment that was said to resemble a bachelor's nightmare. I never saw it. Few did. When he got serious about Marlene and realized he would sooner or later have to take her there, he asked his sister to clean it up "just enough so I can have a cleaning person come in." I gather it wasn't filled with rotting Kentucky Fried Chicken or anything. It was simply filled with everything he had ever brought home and put down, still there wherever it landed, and had never been dusted. He and Johnny Morris made a bet once with a TV set as the wager. When Johnny lost, he got a giant old console set and had it delivered to Gene's apartment. The delivery guys dumped it inside the door. It was never moved, and from then on the door never opened all the way. There was always a little of the Yale undergraduate in Gene. Tim Wiegel, his roommate there, later a sportscaster, told me Gene was famous for wearing a Batman costume and dropping out of trees. He studied philosophy, considered law school, decided to take some time off first. "I told my dad I thought I'd like to try a job in newspapers," Gene said. "He said he'd give me a ride downtown. We had always been a Sun-Times family. For some reason, I never knew why, he dropped me off in front of Tribune Tower." Less than a year after walking in the door, he was the Tribune's film critic. He got his second job, as the movie critic of the CBS Chicago news, because the newscast was bring reformatted to resemble a newspaper city room. 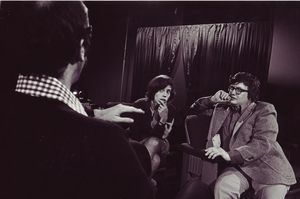 Van Gordon Sauter, the executive producer, recruited Gene on the theory, "Don't hire someone because they look good on TV; hire them because they cover a beat and are the masters of it." Gene speculated that was the reason for the success of our show: We didn't look great on TV, but we sounded as if we might know what we were talking about. Gene met Marlene Iglitzen when she was producing the CBS news in Chicago. "We fought like cats and dogs," she told me. She moved to CBS in New York. He started to see her in New York, and when she was visiting her family in Chicago he would bring her to screenings. I don't recall him ever bringing any other dates to screenings. She was the one. I remember once we were all in a car in New York, and Gene said he wanted to show me the holy place where he had proposed marriage to Marlene. I think this was on Second Avenue. "There it is, right on the corner," Gene said, taking Marlene's hand. "My darling Gene," Marlene said. He had discovered the right woman. I am going to violate a confidence. Thea Flaum was the person who formed our show on PBS and guided us through our rocky first years. She said to me not so long ago, "You know Gene could sometimes he difficult to deal with. Well, you both were. Marlene is a smart woman, she worked in TV news, I wondered how it would work for her being married to Gene. Rog, after I saw them together for awhile, I came to the realization that in the most important ways they were the same person." Marlene kept her name. 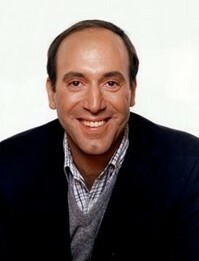 "When I introduced Marlene Iglitzen to Mel Brooks," Gene said, "Mel asked her, 'What was it before you changed it?'" They had two daughters, Cate and Callie, and a son, Will. The girls were flower girls at our wedding. They followed Gene to Yale, and Will seems to be headed there. The Siskels threw a party for us before Chaz and I were married. I remember the party before Gene was married. There was a mentalist who told me everything in my own wallet. This was astonishing; I knew my wallet had been in my pants during the whole party. "How does he do that?" I asked Gene. "I don't know, but I'll tell you one thing," Gene said. "He couldn't tell me what was in my wallet." Once we were invited to speak to the Harvard Law School Film Society. We walked into their Mock Trial courtroom armed with all sorts of notes, but somehow got started on a funny note, and the whole appearance became stand-up comedy. Separately or together, we were never funnier. Even the audience questions were funny. Roars of laughter for 90 minutes. I'm not making this up. I don't know what happened. Afterwards Gene said, "We could do this in Vegas. No, I'm serious." He was always serious about things like that. That night we had dinner together in a hotel in Cambridge, and had our longest and deepest philosophical discussion. We talked about life and death, the cosmos, our place in the grand scheme of things, the meaning of it all. There was a reason Gene studied philosophy: He was a natural. He spoke about his Judaism, which he took very seriously. His parents had started one of the early synagogues on the North Shore after World War II. "I had a lot of long talks with my father about our religion," Gene told me. "He said it wasn't necessary to think too much about an afterlife. What was important was this life, how we live it, what we contribute, our families, and the memories we leave." Gene said, "The importance of Judaism isn't simply theological, or, in the minds of some Jews, necessarily theological at all. It is that we have stayed together and respected these things for thousands of years, and so it is important that we continue." In a few words, this was one of the most touching descriptions of Judaism I had ever heard. In early 1998, I began to notice that Gene sometimes got things out of order; strange, for a man who was always alert and precise. 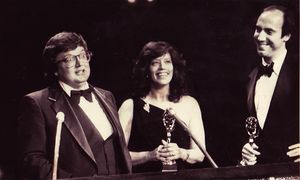 We emceed an awards show with a dozen categories, and Gene asked me to brief him every time we went onstage. 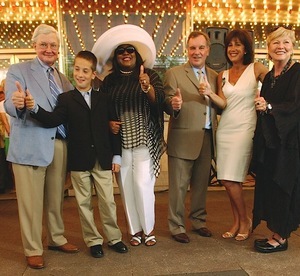 In April of that year, we were the guests of honor at a benefit gala for Chicago's Museum of Broadcasting. It marked the 23rd anniversary of the show. "Why the 23rd?" I asked Chaz. "Why not the 25th?" We decided maybe the museum needed the money. That night, Gene addressed a lot of his remarks to his family, seated at a table right in front of the stage. He told them things they should be sure to tell Will when he grew older. He mentioned some of his values. He spoke of their education, and the importance of finding a job you love. I took quiet notice of that. Not long after, Jay Leno brought his show to Chicago. In the limo going out to the Rosemont Horizon, Gene said he had an unbelievable headache. Backstage, they found a darkened room and a cool cloth for his eyes, and gave him some Advil. We were supposed to judge a contest of Jay lookalikes. "My headache is too bad to focus on it," he told me. "You do it and I'll agree with everything you say. You can looked amazed. We can make it a shtick." After the show, Stuart Cleland, our executive producer, said, "Gene, I'm taking you to a hospital." Gene refused. "Nothing doing. I'm going to the Bulls game." His team was in the playoffs. Chaz and I watched the game on TV, and saw Gene in his usual seat on the floor. A day or two later, we heard that Gene had gone into Northwestern Hospital for some tests. We flew to the Cannes festival, and Stuart called us in France: "Gene is having surgery." We wanted to call and send him flowers. "I don't know where he is," Stuart said. "He didn't tell me." We later found out it was Sloan-Kettering in New York. There was a statement that Gene had undergone tests and was recovering after a procedure. Gene took some time off (together we chose Tom Shales of the Washington Post to sit in for him). When he returned to the show, he was obviously ill, but we never discussed his health, except to agree that he was recovering--recovering from what, was never said. I understood this at the time, and understand it better now. Gene was a competitor. He knew all about odds, and they were against him. But from that summer through the following February, he continued to attend screenings and do the show. 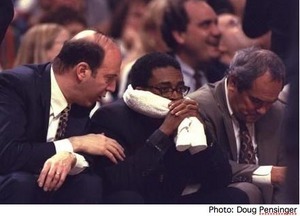 He was often in his seat at Bulls games. What he went through, only Marlene knew. He spoke to his family about his illness, but to no one else, not even his best friends. He was unhappy when the Tribune ran an item saying his recovery was "on schedule." He asked, "What schedule? Whose schedule?" Before his final shows, the studio was cleared so that his nephew could help him walk onto the set and take his seat. No mention was made of his illness. He taped his last program a week or two before his death. His pain must have been unimaginable. But he continued to do his job, and I never admired him more. Our eyes would meet, unspoken words were between us, but we never spoke openly about his problems or his prognosis. That's how he wanted it, and that was his right. In a way, we had that our talk on that night in Cambridge. We talked about what mattered. We once spoke with Disney and CBS about a sitcom to be titled, "Best Enemies." It would be about two movie critics joined in a love/hate relationship. It never went anywhere, but we both believed it was a good idea. Maybe the problem was that no one else could possibly understand how meaningless was the hate, how deep was the love. The following three videos were taken offline for a time, but have now been restored to YouTube.